“The Long Run” was the long awaited follow up to The Eagles’ great 1976 album “Hotel California.” That previous album began to take them away from their easy listening sound to more of a harder rock sound and “The Long Run” continued along in that direction. My first taste of this classic album was when I was on leave after just finishing boot camp and the song “Heartache Tonight” came on my AM car radio. I was very impressed by the harder sound of the guitars and even more impressed by the guitar solos in it. Side tracking for a moment, I will say that Joe Walsh and Don Felder never receieved the respect due them as guitarists, even after their solo tradeoff in the song “Hotel California.” Anyway, tracks like the last one mentioned as well as “In The City” which Joe Walsh brought over from “The Warriors” soundtrack, “Disco Strangler” and “Teenage Jail” are just some of the harder rock songs that help make this album so great. Saying that, “The Long Run” doesn’t totally take them from their roots of the easy listening countrified sound. There are a couple of tracks that remind us where they came from. Such songs as “The Sad Cafe” and “I Can’t Tell You Why” bear testimony to that fact and to me, the title track of the album serves as the bridge between the soft and the hard. Add all of these things together and you get a fantastic album that has continued to remain so over three decades. “The Long Run” was the first album not to feature founding member Randy Meisner on bass who was replaced by Timothy B. Schmit. I have also noticed that when I posted the tracks, I don’t remember them being in that order in my cassette. I guess it’s a trip back up the loft to see for myself or maybe I should just get a CD. Still, this is a brilliant album and the first new album I listened to as a marine. 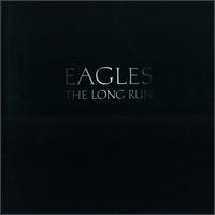 This would be the last Eagles studio album before their break up in 1980. I have always put that down to so many talented musicians each wanting to go a separate way. The evidence is the solo albums each one of them recorded afterwards that I will be visiting down the line. This entry was posted on September 6, 2012 at 12:22 pm and is filed under 1979, Music, Rock, soundtracks, Uncategorized with tags Classic Rock, Don Felder, Don Henley, Glen Frey, hard rock, Joe Walsh, The 1970s, The Eagles, The Long Run, The Warriors. You can follow any responses to this entry through the RSS 2.0 feed. You can leave a response, or trackback from your own site. This was my first Eagles album ever. 🙂 You’ve covered yet another tried and true Rock ‘N Roll classic! I feel the black cover for ‘The Long Run’ is superb in all of it’s artistic simplicity. The black cover with just the band name & album title is identical (in it’s art form) to that of AC/DC ‘Back In Black’. I had to mention it, cause I’ve always wanted to somewhere! LOL! Feel free to mention it here. Maybe the album covers are so similar because they’re both such classic albums. Another great write-up on an album that doesn’t get the respect it deserves (even from some of the musicians involved, I think). “Heartache Tonight” sounded so fresh when it received regular airplay that year, and the other songs you mentioned are also great ones that hold up all these years later. I’ve also always had a particular affection for the silly-but-fun “The Greeks Don’t Want No Freaks.” They didn’t often show any kind of humor in their music so this was a pleasant surprise. As for Felder & Walsh, it’s true that they’re one of the more unheralded guitar duos in rock history, but maybe because they always played what was perfect for the song. Thank you. I remember how great it was to hear “Heartache Tonight” played on AM radio and I thought the same about “The Greeks Don’t Want No Freaks.” Interesting insight on Walsh and Felder, still they didn’t get the respect that they truly deserved. I still think they secretly influenced the styles of many a guitarists of heavy metal bands in the 80s.